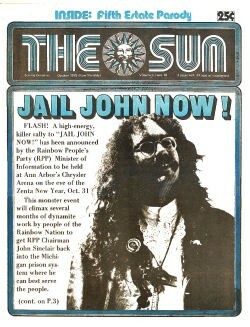 A high-energy, killer rally to “JAIL JOHN NOW!” has been announced by the Rainbow People’s Party (RPP) Minister of Information to be held at Ann Arbor’s Chrysler Arena on the eve of the Zenta New Year, Oct. 31. This monster event will climax several months of dynamite work by people of the Rainbow Nation to get RPP Chairman John Sinclair back into the Michigan prison system where he can best serve the people. However, at this printing the reactionary chomps that make up the pig judicial system of Amerika refuse to let our righteous brother back into the pen where he wants to be. A massive petition drive and political lobbying campaign is currently taking place with over 100,000 signatures demanding the incarceration of Brother John being prepared for presentation to people’s State Representative I.M. Stone the night of the gigantic rally. People’s speakers and musicians will be mightily featured at the rally with the keynote speaker being Detroit Mayor Coleman Young. Young was reached by The Sun after the mayor had just returned from protecting a string of small businesses on Livernois, and gave his reasons for his support of the “JAIL JOHN NOW” committee. “Well, that boy has settled down a lot from the revolutionary he used to be and I think all decent people ought to support his right to be back in prison if he wants to be,” said Young. Other speakers will include Recorder’s court Judge Justin, who has stepped down from the bench and handing out sentences to represent Brother John in Federal Court demanding that Sinclair be permitted back in prison. Also, speeches will be heard from Jerry Rubin, Tom Hayden, Eldridge Cleaver, John Lennon, Yoko Ono, and with a special appearance by Timothy Leary. Music will be provided by some of the killer bands of the Rainbow Nation; the reconstituted MC5, the mighty UP featuring Frank Bach doing rhythms on the side of a coinbox, and a special set by the Downhome Tyrannosaurus of Despair. The scene at the Chrysler Auditorium will be a spectacular gathering of the tribes with heavy doses of the sacrament in use to demand that the state “JAIL JOHN NOW!” We need your participation. 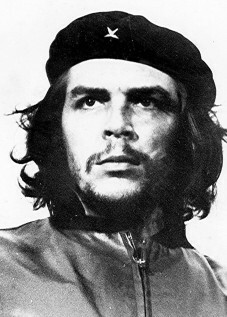 STP (SERVE THE PEOPLE, SELL THE PAPER), SEIZE THE TIME, OFF THE SLIME; ALL POWER TO US! The following question was asked of some superstars of the ‘sixties that THE SUN helped make what they are today: What do you think about The Revolution now? “I for one, intend to develop a new relationship with the U.S. military. I’m on a honeymoon with them myself. I love ‘em. It warms my heart to see politically concerned youngsters grow up and gain a sense of responsibility. Take this newspaper you are now reading for example. The White Panthers, as they were then known, encouraged disrespect for authority in all areas of life. They claimed that all police were bad, that a system which needs police is inherently corrupt, that capitalism was evil and destined for an early death, and that there was something wrong with a society whose goal was maximizing corporate profits. It is tragically irresponsible for people who consider themselves leaders of public opinion to pander to such popular, rabble-rousing ideas. When the Detroit police made it hot for the people of “Translove Energies,” they moved to the hipper, greener pastures of Ann Arbor, a community much more homogeneous and easier to understand than Detroit. Here, with radical energies declining across the nation, they were faced with a dilemma–when radical political movements decline, where do radical politicians go? It’s my contention, and history will back me up, that radical politicians are politicians first and radicals second. Not ones to challenge history, the people of Translove Energies, a/k/a The White Panthers, the Rainbow People’s Party, The Warren-Forest Sun, The Ann Arbor Sun, and the Sun, joined the fray of capitalist politics. “Power to the People” became power to the politicians. Unfortunately, the SUN people moved too far to the right for the constituency in Ann Arbor. Their readers were much more radical than they were, and shunned their efforts to involve them in electoral politics. So now, having come a full circle, the White Panthers return to Detroit, supporting Democratic Party politicians, encouraging people to join the system to liberalize it, and in general, reinforcing the passivity that makes people submit to the wasteland of capitalist daily life. In the current issue of the SUN a guest editorial condemns the Livernois uprising of two months ago, and urges people to trust me, your beloved Mayor. In a city plagued with problems like the lack of respect for authority, especially the authority of capitalist politicians, the SUN will be a valuable asset in stemming the tide of anarchy. That’s just what the ruling class of this city needs–responsible media. Besides, they’re the only white people who ever say anything nice about me. 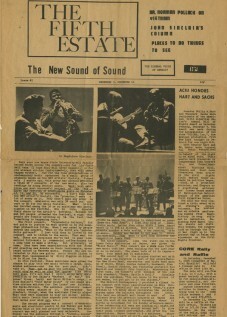 I am a big fan of your newspaper, especially since the now-defunct Fifth Estate has changed its form. They never really understood how to sell a paper in this city, and it took some smart kids from Ann Arbor to make a solid go at it. What I really appreciate about the SUN is the way you have a good understanding of your constituency and serve them well. Yes siree, a real community service newspaper! Take your last issue for example. 16 full pages of advertising! The FE deigns to print nary a column inch of commercial ads, but the SUN sees that their real constituency is business and that the best way to serve the people is to convince them to buy, buy, buy BUY! What’s good for capital is good for people. The SUN has openings for two people to write, layout and distribute the SUN, in addition to sweeping the offices and shining the shoes of the other 432 staff members. Due to recent reorganizations of the staff, all former members are now coordinating the advertising sales staff. In addition to the above two positions, we have openings for 400 advertising sales people. Applicants must be highly motivated, fast talkers and good card sharks. Compensation is high for qualified people and the first 200 applicants will be given free shoe shines.